Posted under Parents' Articles. Updated 16 March 2017. Some teenagers have difficulty keeping up with the energy needs of their bodies and may be underweight. The reasons for this may be that they are growing taller, exercising a lot with sports, or might simply have a high metabolism (the way our body burns calories). Growing during the teen years requires more food energy than at other times of life. Teens can lose weight when they are burning more calories than they are taking in. Some teens grow at a different pace than their siblings or friends, and each teen will experience different periods of fluctuations in their weight. Your teen’s health care provider may have suggested that your teen gain weight. This guide was created to give you some ideas on how to help your teen achieve a healthier weight. This guide is intended to help parents of teens who do not suffer from an eating disorder or other medical conditions that cause significant weight loss. What are the medical implications of my teen being underweight? A teen who is underweight may not be getting balanced nutrition. He may not be getting enough vitamins, minerals (such as iron and calcium), protein, or dietary fat for a healthy body. For example, a growing teen needs plenty of calcium and vitamin D to make strong bones. When a teen is expending more energy than they are taking (via calories from the food they eat), the body’s fat reserves are disrupted which can compromise the immune system. When the immune system is compromised, a person is more susceptible to acute and chronic medical conditions. Unintended weight loss in anyone is a reason to be evaluated by a health care professional. Sometimes there is an underlying problem that is responsible for weight loss. Thus it is very important to talk with your son’s primary care provider about your concerns. Call right away if he has any of the following symptoms: fever, vomiting and/or diarrhea, cough, ear pain or sore throat, decreased urination, and/or increased sleepiness. How often should my teen be eating? The goal is 3 meals and 3 snacks daily (trying not to go longer than 4 hours without eating). Don’t worry about variety initially – the important thing when working on catch-up weight gain is getting the extra calories and protein. Once you’ve found things that work for you and your teen, stick with them. What should my teen add to increase energy and calories to meals and snacks? Add butter or margarine (trans fat-free) to food. For example, at breakfast, spread a generous amount of butter or margarine on bagels, toast, English muffins, or an egg sandwich. At lunch and dinner, use butter/margarine when cooking. Top warm veggies with a scoop. Use whole fat dairy products such as whole milk, full fat or regular cheese and yogurt instead of skim, reduced fat, or low fat dairy products. For example, at breakfast suggest that your teen have a glass of whole milk with his meal or with cereal or oatmeal. At lunch, suggest using regular, full fat cheese (cheddar, American, Swiss) in an omelet or on a sandwich or burger. For dinner, suggest another glass of milk. Try adding cheese to baked potatoes, sprinkle parmesan cheese on veggies or any entrée. Your teen can enjoy regular ice-cream instead of low fat or frozen yogurt for desserts or treats. Work on increasing portion sizes and remember to offer a glass of milk with each meal. Modify Cooking: Use heart healthy oils when cooking meals like olive oil or canola oil and add healthy extras to dishes. Experiment by adding almonds to salads, cashews to a trail mix, or granola to yogurt. Add a scoop of sour cream to baked potatoes and try an all-natural peanut butter on celery, crackers, or in a peanut butter and jelly sandwich. Use “Extras”: These are items added to foods and drinks to enhance flavor and energy. For example, mix in Carnation Breakfast Essentials® powder to a glass of whole milk, to a yogurt smoothie or with a milk shake. Try mixing in Ovaltine® with a glass of milk. Add dried fruit or granola to yogurt, chop a hard-boiled egg into salad, or add chopped avocado (with a little lemon juice) to tune or chicken salad. Maximize Portions: You may wonder how much food to offer your teen at meals and snacks. Paying attention to portions is a great idea for weight gain. First, think about how much your teen eats for most of his meals and snacks. Slowly try to increase the overall volume of food at each meal, starting with one meal. For example, try adding one food item to a typical breakfast. Try granola or any other calorie rich cereal instead of the lighter cereals. Once portions have increased over a few days at breakfast, add more to dinner or lunch. Do the same with snacks. Create a double snack by just doubling the portions at a typical snack. For example, instead of two small cookies, offer 3 or 4 small cookies with whole milk. How quickly should my teen gain weight? Usually 1-2 pounds per week is a safe and healthy weight gain goal, until your child has gained the appropriate amount as indicated by their health care provider. Most people do not gain exactly the same amount of weight per week. As long as the overall trend during the course of several weeks to a month is weight gain, your teen is moving in the right direction. His medical team will let you know if the pace is too slow. 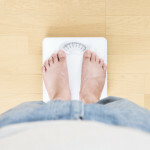 Should I check my teen’s weight at home? It is usually a better idea to have your teen’s health care provider or dietitian check his weight at clinic appointments. Checking weight too frequently at home can be frustrating for everyone, especially if the weight isn’t going up. By having his weight checked in the office, the same scale is used and accuracy is ensured. His medical team will let you know how often he needs to return for weight checks and whether it is necessary to check his weight at home. Can my teen gain weight if he is a vegetarian? Yes. Teens can gain weight if they follow a vegetarian diet. Most vegetarian diets are naturally lower in calories, because the focus is on eating more fruits, vegetables, and non-meat protein foods. However, by following the tips in this guide, your teen can gain weight and still make healthy vegetarian meal choices. There are lots of high-calorie vegetarian ingredients such as cheese, avocado, nuts, and nut butters. Does my teen need special vitamins or mineral supplements? A standard over-the-counter multivitamin with iron is a good idea for teens; these vitamins often provide the right amount of vitamin D, too. The generic store brand is usually the same as a name brand, and it is often less expensive. If your teen is eating enough calcium containing foods (3 to 4 servings of dairy proteins/day such as milk, yogurt and cheese), he probably does not need to take a calcium supplement. In some cases, his medical team may prescribe a specific supplement, based on his body’s needs. Supplements are products that are designed to help people gain weight. For example, liquid shakes include Boost®, Boost Plus®, Ensure®, Ensure Plus®, or any generic version of these. Supplements may be useful if weight gain is not happening quickly enough after food portions are increased, high calorie fluids are introduced, and snacks plans have been in place for several weeks. Your teen’s health care provider will let you know if he needs to take supplements. What should I do if my teen refuses to eat more? Try to be patient. Sometimes it takes a while for teens to get on board with their new eating routine. Look at each addition as an accomplishment. You will see progress over time. A counselor or dietitian can help your teen if he is struggling with finishing the increased portion sizes or if he is having trouble making dietary changes. What if my teen compares his eating patterns to other family members? Encourage your teen to avoid comparing his eating style with other family members or his friends. In order to gain weight, he will likely be eating more frequently and consuming larger portions than others. It is important that your teen understand that everyone has different nutritional needs. At this time, it is necessary for your teen to eat differently for his overall health and height growth. Do I need to make special meals for my teen? No, but it will be helpful if you plan meals and snacks in advance. Include your teen when selecting food and have him help with grocery shopping and food preparation if his schedule permits. At meals, select recipes that are easily modified. In some cases, you may be able to prepare two versions of a meal, for example: macaroni and cheese with whole milk and regular cheese, and macaroni and cheese made with low-fat milk and cheese for other members of the family. Remember, this is likely a temporary situation and you will not always have to make modifications. Should I worry about reading food labels? Reading labels on food products is a good habit to adopt. This practice will help you identify health claims and the true nutritional value of food items. Compare this information when selecting foods while grocery shopping. Nutrition fact sheets are usually found above fresh produce in grocery stores and some stores have their own website which lists all products and nutritional information. You can also check out the nutritional information of your teen’s favorite fast food online. Simply use the internet to locate the restaurant and click on “nutritional information.” When shopping, use food labels to help you select calorie rich items. Look at protein, calcium, iron, dietary fat, and other nutrition information when making choices. Be sure to look at portion information as well. Generally, foods that supply the highest amount of calories and nutrients for the smallest portion size will help your teen gain weight the most. Should my teen meet with any specialists? A Registered Dietitian (sometimes called a nutritionist) who specializes in working with teens is a great part of the treatment team. The dietitian will make an individualized plan for your teen, taking the whole family into account. Your teen will learn specific ways to get the nutrition he needs to reach a healthier weight. Sometimes one visit is all that is necessary to get on track. In other cases, follow-up visits are required until weight gain and healthy goals are accomplished. Your teen’s dietitian will set the pace for how often they meet, once a month, every other week or weekly. A mental health counselor or therapist who specializes in working with teens may be helpful with goal setting and providing help with any anxiety related to food and health. Energy or calorie-containing fluids include: whole milk, juice, smoothies, milk shakes, Carnation Breakfast Essentials® powder, or regular soda (for a treat). Avoid calorie free or low calorie drinks such as diet soda, Crystal Lite®, or seltzer water. Your teen should drink at least 8 ounces of calorie fluids with each meal and snack. Protein bars are another type of supplement. They come in many different brands and flavors. Bars that have a balance of carbohydrates, protein, and fat are okay to have as a snack or part of a snack. Avoid bars that are extremely high in any one nutrient. Are there any foods or fluids my teen should avoid? Certain foods and drinks that lessen appetite and those with no nutritional value should be avoided. Encourage your teen to omit or decrease his consumption of caffeine and caffeine containing products. How do I make sure my teen doesn’t gain too much weight? Your teen’s health care provider will be checking his weight periodically. When weight maintenance is appropriate, you will be informed. Simply altering some ingredients (decreasing the number of servings of fruit juices or other high calorie drinks) will help to reduce the amount of daily calories if necessary. Working with a dietitian can help with the transition to weight maintenance. It is very important to focus on a positive health and energy level, instead of over emphasizing the numbers on the scale. Remember, young teens are growing and gaining height, which requires an increase in body weight that is consistent with their height and age. It’s okay to encourage your teen to finish his meal or snack, but do not force him to eat or to clean his plate. Prepare meals with high energy/calorie food and keep the volume of food normal. Eating on a schedule can help. Encourage your teen to eat three meals each day and three snacks in the mid-morning, afternoon, and evening before bedtime. Make an appointment with a dietitian who specializes in working with teens. The nutritionist will make an individualized plan for your teen, with consideration of other family members. Your teen will learn specific ways to get in the nutrition he needs to reach a healthier weight. Be sure that food and nutrition doesn’t take up all your time and thoughts. Thinking and talking about good nutrition is key when trying to encourage weight gain but remember to have discussions about school, sports, current events, and feelings with your teen.